Hi everyone. After a breake because of work and family, my friends push me now to continued on my Enigma 2666 Mod. In the last time before I chancel everything some models are released by Kevin what I can use in the Campaign. Afterall I get some help with the Stealth of the Strakha MK1 and now it works. The Confed Sol Sector Base is still not done so the Ella Base is a Placeholder. Here the Venture with Guns, Exeter, Bengal and a Waterloo are in this scene. In the background a Gettysburg and a Concordia Class Carrier. Hi there. It's good that you kept up with this. I looked at your progress thread and I noticed that there were a few that are not there. Best Ralari I have seen is this, however, I am not sure if Howard Day has posted this somewhere for download. If you want to be ready for Wing Commander Saga: The Darkest Dawn, then download and play the prologue first. You 'll understand why once you have. I think its more easy to convert the Standoff models. Bloodfang MK1, Targu II, Krant, Salthi, Dralthi, Gratha, Jalthi, Artemis, Tarsus are all there. I need someone who can transfer it to the Saga Engine. Textures can be shared from the one we already have. FekLeyrTarg has already done the Supply Depot but need Textures and Kilrathi Turrets on it. K'titrak Mang and Sol Sector Base and we have the most of the Ships. Only the Dorkir, Ralari and Drayman need complete new models. 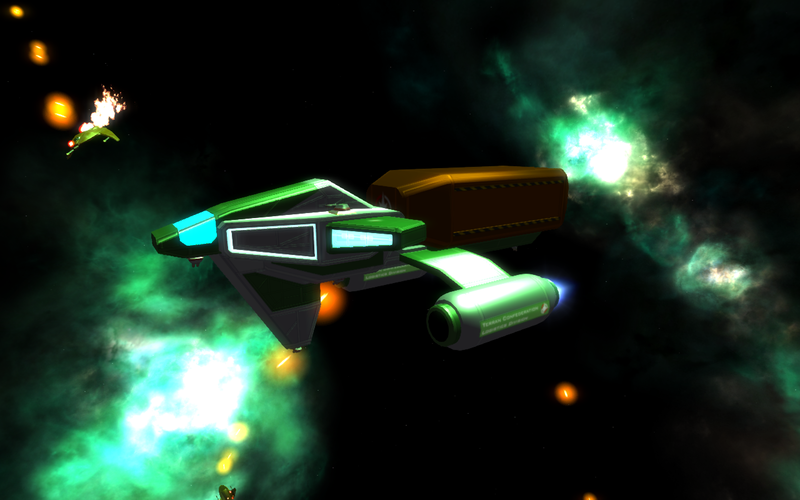 The Drayman is already done for Freespace 2 by CMDBob but he answerd me not yet for his model. http://i.imgur.com/keU12.png It would be only need for another turrets and textures... I ask him again. That Drayman, good as it might be, is no match for the Drayman of Howard Day. I hope someone from the community takes it upon him and transfer this to a freespace open model you can use for your mod. Hopefully someone can be found that can make Standoff models transfer as well. I thought that Howard Day's Models have too many polygons for the Freespace 2 Engine. also, deathsnake, did you get your models from jasonrockz's collateral damage project? Drayman, Sol Sector Base, Ralari, K'titrakh Mang, Bloodfang MK1, Supply Depot Confed, Targu II, Kilrathi WC1 Fighters, Sivar and Hakaga (SO3) Dorkir and new turrets (from the prologue) on the Confederation, Waterloo, Gilgamesh, Jutland, Hhifra and 6 fighterbays (3 each side) on the Bengal. If somebody can transfer Standoff Models (we have permission) or can replace the old turrets pm me or FekLeyrTarg on CIC or Hard Light Forum. The Kilrathi Supply Depot is done by FekLeyrTarg. Its just need to convert into Saga and textured and gunned with 6-8 Kilrathi Laser Turret. A fleet is nothing without support! Its unarmed, we need a few turrets on it..
Now the fifth fighter of Wing Commander 1. 30m long, 30m width and 12m height. Armamend are 2 Laser and 2 Mass Driver Cannon and 3 IR, 3 HS and 2 Torpedos. The Raptor 3 IR, 3 HS and 4 Torpedos. The Scimitar, 3 IR and 2 Torpedos. The Cutlass fits between the Scimitar and the Raptor. More weapons, armor then the Scimitar but less weapons and armor as the Raptor. Update on the Drayman. Still the Container goes in the wrong direction Changing the dockingpoints does not work. Perhabs someone has one done with a simple textur? FekLeyrTarg done hier first complete model, the Dilligenttank. I build the Pof with the size, cords and path and now its done: The Dilligent! I'm glad I was able to help at this point. The Tank wasn't hard to build and to UVMap. It took me maybe half an hour and maybe another one for the Textures thanks to Talon_1024. After a lot (and lots, and lots..and..lots) trys...it work! there is a cloaking Strakha there (see the smoke) but not on the Radar. I need in the pics another VDU Ani File... so here the Grikakh are placeholder. Can someone do one for the Enigma2666 Mod? It's the WC2 Remake. But another name because the Saga Team did not like Campaigns with a Remake title in it (read here: http://www.hard-light.net/forums/index.php?topic=77055.0) I changed now every mission from the original Wing Commander 2 with more ships or more Wingmans or another Capship, its own interpretation. But from the storyline its the same. So, it's essentially "what WC2 would be if it had modern-day tech" campaign? The original was very limited, mostly by hardware of the time, so I'd like to see a more modern interpretation. Right. And like in Standoff you will see ships from the Wing Commander 1 Timeline. So the Ghorah Khar rebels have WC1 Confed / Kilrathi Fighters. The Confeds on Olympus the newer one from WC2 Or not always kill a Fralthra or Ralatha... you can destroy : Ralari, Fralthi, Kamekh, Ralatha, Fralthra, Snakeir, Dorkathi, Dorkir, Supply Depot, Starbase (WC1) and of course, K'titrakh Mang. In the different Systems are now more life. You see Exeter, Drayman, Venture, Bengal, Gettysburg, other Confederation Class, Waterloo, Gilgamesh, Clydesdale, Free Trader, Talons (Pirates) and some other ships and stations. Prob are that a lot of WC1 stuff is still missing The Drayman was the last Confed capital ship on the "to do list". Kilrathis are missing and space stations. We have the Supply Depot from FekLeyrTarg but it still need textures and turrets. I ask a few people from the CIC (CMDBob, Czacen, Jason and Starman) if they can help us make some ships for Enigma, LLoD or O.S.